Before they can build their online store, eCommerce retailers first have to choose their platform, finding one that supports both their company’s needs and budget. 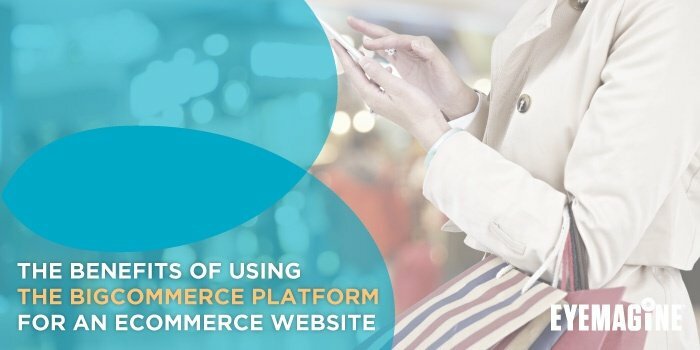 For many, a template-based platform like BigCommerce is the ideal choice. Why? It’s cost-effective, fast, and easy-to-use. Here, we discuss these BigCommerce benefits, explaining who they work for and why they are such big pluses for so many eCommerce retailers. BigCommerce is among the most affordable platforms out there, both immediately and long term. First, the startup cost is typically much lower than it is for other platform options like Magento. This makes it an ideal choice for eCommerce retailers that are just building or trying to grow their online store. Why? Many of these companies simply don’t have the capital or the need to invest a large sum of money into a website development project. Instead, they are better served if they save that money while they build their revenue, data and customer base, choosing a platform that allows them to save up in this way. BigCommerce takes this into account and allows companies to sidestep these unnecessary development costs. Looking next at the long-term cost, BigCommerce is extremely cost-efficient throughout the website development process and once the site is live. As a platform, it requires very minimal customization and development: most features are already built into the templates, and developers work around this existing frame. On a platform like Magento, this isn’t the case: site developers are often starting from scratch, which means that they have to spend time and money developing code, customizing extensions and building the site that they want from the ground up. This means unexpected expenses and difficulties that most eCommerce retailers just don’t have the time or money to deal with. In the world of eCommerce, time really is money: an online retailer’s site doesn’t begin to generate revenue until it goes live, which means that a drawn-out development process translates to lost capital over time. For this reason, it’s always recommended that eCommerce retailers get their Launch Pad site— or starter site—up as quickly as possible so that they can start accumulating data, revenue, and a strong customer base. With BigCommerce, this is completely possible: because of its template-based structure, the basic pages of an eCommerce site—like home page, product categories, product page, about us, and blog— can be up and running in a matter of weeks. Further, all extensions and applications can be easily selected and installed. This means more efficiency, faster growth, and increased scalability. With a from-scratch, customized platform like Magento, this is inevitably a much more time-consuming and involved process, requiring more people, skill and capital. For a growing site that doesn’t require extensive customization, this can and should be avoided. Developing an eCommerce site on BigCommerce is easy and user-friendly for everyone involved. From a developer’s perspective, the responsive template-based structure makes their job much more efficient and straightforward than it would otherwise be: they don’t have to manipulate the back-end of the site at all, and they can essentially just import all of the site’s data into the pre-existing templates. First, many "extra" things that must be included in an eCommerce site— like security implementations and PCI compliance— come standard in BigCommerce, meaning that eCommerce retailers can easily implement all of these necessities on their own. On other platforms, these implementations can be much more complicated, requiring the help of an agency to make sure that their site is completely secure and compliant. Along the same lines, features that increase revenue and conversions—like single-page checkout, social media integration and abandoned cart recovery programs— can essentially be downloaded with a click on BigCommerce.This means that site owners can analyze their data and incorporate these extensions on their own when the need arises. On other platforms, again, such features need to be custom-coded and integrated by skilled developers, meaning that site owners cannot be fully hands-on. Finally, once the site is live, site owners can easily manage it on their own and take over all administrative tasks. This is because the admin panel in BigCommerce is extremely user-friendly, requiring no training or instruction ahead of time. When maintaining their site, then, owners can easily manipulate their data, categories, and filters themselves— without having to hire an agency or an additional team member to take charge of this task and manage their technology. Essentially then, BigCommerce allows eCommerce retailers to get their websites off the ground and quickly take full control.